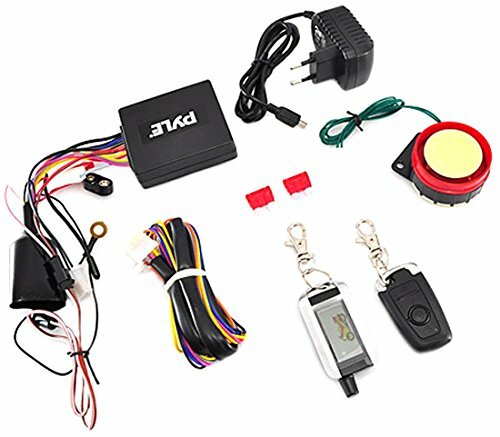 The Pyle Watch Dog Motorcycle Alarm Systems ensure complete vehicle safety and security that also features remote engine auto-start and remote engine shut-down. This custom installation kit includes 2 electronic control unit transmitters (one with LCD digital display control interface) siren speaker wiring harness and water resistant AC ignition module perfect for adding reliable vehicle protection that makes for a beneficial weekend project. The Watch Dog Alarm System is easy to use with simple touch-button controls. Additional features include mountable LED indicator light anti-hijack engine shut-down ability high-powered siren alarm 8-level impact sensitivity adjustment keyless driving function and more. You'll also have the ability to 'lock' your engine to prevent unwelcome vehicle start-ups. You can rely on the Pyle Watch Dog Alarm System that keeps an eye on your vehicle's safety. FeaturesQuickly and Easily Arms and Disarms Remote Button-Activated Auto-Start Remote Engine Start &Remote Engine Shut-Down Simple Touch-Button Remote Controls Safe and Reliable Engine Immobilization Engine Will Not Start Once Alarm Activates Anti-Hijack - Button Activated Engine Shut-Down Includes 2 Mini E.C.U. Control Transmitters 1 ECU with LCD Display 2-Way Transmitter 8 Level Impact Sensor Sensitivity Adjustable Mute Alarm Mode Compact High-Powered Piezo Siren Water Resistant Power Module Mountable Alarm Activation LED Indicator Light Keyless Driving Function Remote Panic Siren Alarm Activation Panic - Siren Sounds and Lights Flash Remote Control Arming Disarming Locating System Includes Main Wiring Harness 2 ECU Transmitters Siren Speaker and Water Resistant DC Power Ignition Module Item Weight - 1.45 lbs.